It’s date night again. Tonight I’m super excited to be replacing our old bathroom vanity with the IKEA LILANGEN 2 door sink and cabinet. Man, was this an improvement! In addition to putting down our new peel & stick tile, we switched our old bathroom vanity and sink with this super chic, square top IKEA sink & cabinet. Before we give you the how-to, here’s the before and after. That looks ten time better right. I’ve never been happier to ‘tinkle,’ as my grandmother calls it, in my life. On this one, we had to get some help from my pops! A few things caught us off-guard with this DIY challenge. Unlike our last DIY Date Night, we didn’t have any plumbing issues, but we did have some style problems. 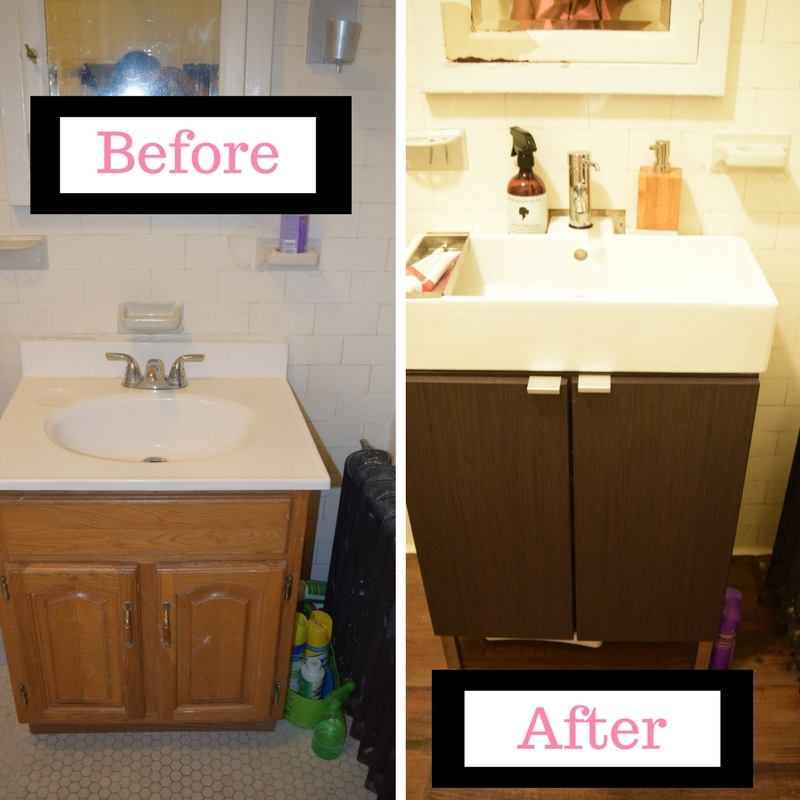 We had to do two IKEA hacks to make this beautiful piece of bathroom furniture fit in our old-school bathroom. Here are two things to consider when purchasing your IKEA LILANGEN bathroom sink & cabinet. The sink and cabinet do not sit flush, but you can totally fix that. 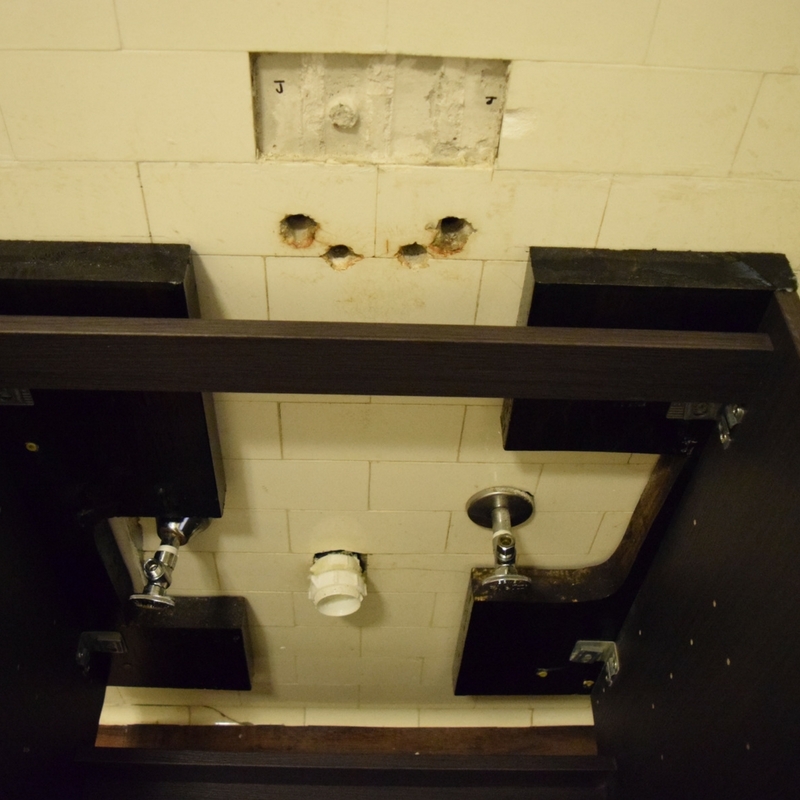 The under-sink plumbing gets a little tricky, but can absolutely be fixed also. So, how did we install our IKEA LILANGEN bathroom sink and cabinet? After hubby put together the bathroom vanity. (This was super easy, just follow the directions.) We discovered that the sink and cabinet did not sit flush. (Meaning about an inch of the sink was hanging over the cabinet.) This would not work for our home. We have too many kids who like to lean on the sink when brushing their teeth. We had to make sure the sink and cabinet line up properly. Dad to the rescue. Here’s what he did. Step 1: Get two pieces of wood approximately 1 1/2 inches wide and 2 feet long. Step 2: Stain the wood the same color as your vanity. Then, coat the wood with polyurethane to protect it from water. Step 4: Drill the pieces of wood into the wall and drill the vanity into the pieces of wood. Your finished product should look like this. Getting the plumbing right underneath the IKEA LILANGEN Sink Cabinet is tricky, but doable. Because IKEA plumbing parts are courtesy of our Swedish friends, their plumbing doesn’t always fit with older U.S. plumbing parts. (And my house is pretty old.) So, you may have to employ an IKEA plumbing hack if you live in an old house like I do. Our LILANGEN Sink Cabinet matches with the IKEA DANNSKAR faucet and plumbing set. To get our under-sink plumbing working, we had to purchase two 20″ supply lines because the supply lines that came with our cabinet were not long enough. We also had to purchase a 90 degree PVC elbow pipe and a 1/2 inch PVC flexible coupling. Check out this video to see how we hacked our IKEA DANNSKAR faucet and plumbing. Altogether we spent about $15. Lastly, place the faucet on the sink and sit it atop the cabinet. Connect the extended sink hoses to the valves and connect the piping to the sink drain. It’s helpful to use your plumbers tape when making all your connections to further secure the hoses and pipes. Complete a water test to make sure there are no leaks. Done! Our next DIY Date Night will focus on replacing our old medicine cabinet with an updated IKEA SILVERAN Mirror Cabinet with storage. That’s a gorgeous sink! High five! Grrl. You know when you’ve been in a relationship as long as we have ANYTHING can become a date night. Thanks for commenting! Wow that made a huge difference and it looks beautiful.I feel so silly because all this time me and my husband have been changing toilets, putting up chandeliers and hanging all kinds of stuff and I never considered it date night lol.